This story is a response to a simple question: what would have happened if the first European settlers at the tip of Southern Africa had encountered not Khoikhoi pastoralists but rather Bantu-speaking agriculturalists? The two main sources for imagining this alternative history are Noël Mostert, Frontiers: The Epic of South Africa’s Creation and the Tragedy of the Xhosa People (New York: Knopf, 1992) and Catherine Cymone Fourshey, Rhonda M. Gonzales, Christine Saidi, Bantu Africa: 3500 BCE to Present (New York: Oxford University Press, 2018), both of which I read for a class with Nancy Jacobs called Southern African Frontiers. I have tried to be as historically accurate as possible, but at heart this remains a thought experiment. 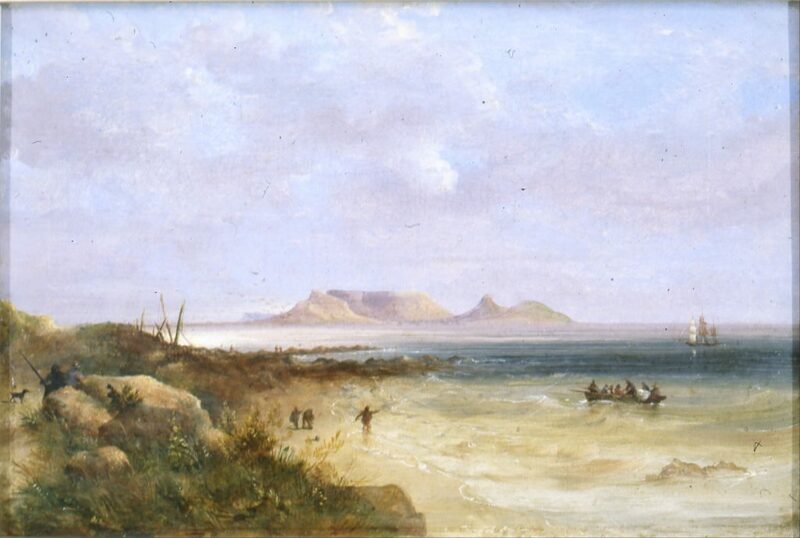 “Table Bay” by Thomas Bowler, in the Iziko Museums of Cape Town. I’ve not come to tell the truth. in the lying, you’ll love my poetry. in poetry that claims to be true, you’ll hate me. Through the blue mists, far away on the horizon, a distinct promontory appeared: the honey-glazed profile of Table Mountain. The sailor who sighted the cloud-high peak sank to his knees in joy and immediately cried out: “Land ahoy!” As the Dromedaris neared the southern tip of Africa, every member of the crew had begun to strain his neck to catch sight of land. For one, the first to see Table Mountain was always given an extra swig of wine, a new hat, or some other gift. Since leaving Texel in December 1651, the passengers under the command of Jan van Riebeeck had lived in filth, disease, and insubordination. In the four months since their departure, not one person on ship had not wished themselves at one point or another to be one of the lowest animals ashore. From the original complement of passengers — two dozen sailors and 100 settlers chosen (or volunteered) by the Dutch East India Company (VOC) — only half had survived. Emotions ran high on the boat carrying the landing party to shore. The prospect of immediate relief was on everyone’s mind. It seemed as if they could already taste the sweet water running down from Table Mountain and curl their toes in the firm, rich soil beneath their feet. But there was also trepidation. The previous night, they had seen bright fires dotting the cape, and some sailors had even sworn that they had heard faraway echoes of song and snatches of conversation. Now, as they neared the beach, they saw that a small group of natives — armed with spears — was awaiting them. How would they treat the strangers arriving on their shores?